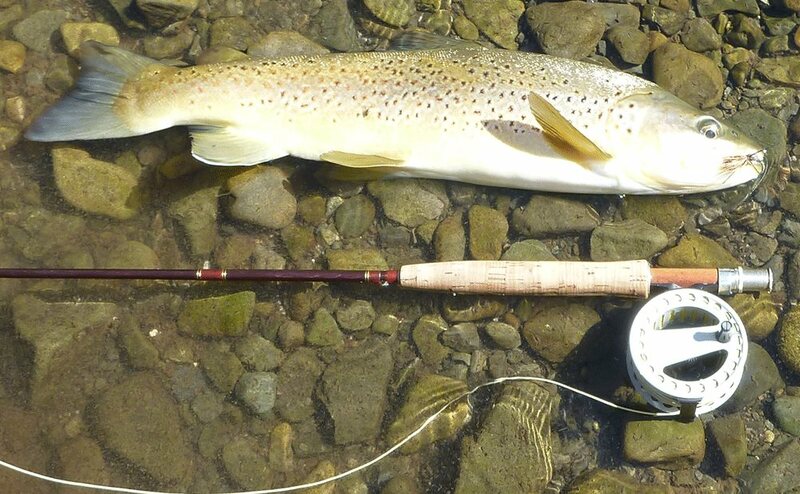 I use three fly rods for trout, all five weights. Each has a slightly different purpose, and has strengths and weaknesses that make them good in different situations. They all have different actions, and this is what makes them different. The three rods are a Scott G Series 905/4, a Scott Radian 905/4 and a Sage TCR 590-4. My favourite ever piece of sports equipment marketing was the Sage TCR. I have been involved in sports equipment marketing for twenty odd years, and this is the best I have seen. TCR stands for Technical Casting Rod, and Sage promoted it as a rod for the best angler and the top caster. That seemed to sell a lot of rods to a lot of “top anglers” and I suspect was not that user friendly for many “top anglers”. The TCR did not last long. It was replaced by the slightly slower TCX, which I did not like as it was not as good as casting long casts as the TCR. Sage TCR 590/4, my fast action rod used for sight fishing on lake edges and casting big dries like a Madam X. Being ultra fast the TCR is not much good on the take. I learned this one spring when the fish were rising intermittently, and I was having little success with a dry fly and an emerger. I changed to two emergers and swung them across the nose of the fish, and had many, many takes but few hook ups. I swapped to my old Sage SP and started connecting with a lot more fish. The closest current Sage is the Method, which I have not used and probably would not buy because I really, really like my TCR. The Method has some good marketing too. Action: Very fast. This is the fastest five weight rod I have used. Uses: Casting a long cast. Casting with few false casts. Casting heavy nymphs. Short casts when muscling fish out of trees. What it is good at: Casting a long way with very few false casts. What it is not good at: Short casts. Striking fish. I fished with a guide in the Caribbean who reckoned it was not much good for drift boat fishing and casting all day, and a softer rod was easier to use. As I do not fish blind I do not make many casts in a day so this is not an issue for me. What I use it for: This is my lake rod, and my rod I use for fishing to cruising fish in the back of big pools with a long leader. I also use it for casting big dry flies like a 10 Royal Trude or a 10LS Madam X with my long leader. Who should use this type of rod: Only buy a really fast rod if you are a very competent angler who fishes a lot. If your timing is out by a fraction it will not strike fish very well, which is why I do not use it fishing the evening rise. Leader I only occasionally use this rod with a short leader. Most of the time I use my long leader with this rod, based on an Airflo 10ft Floating Polyleader.